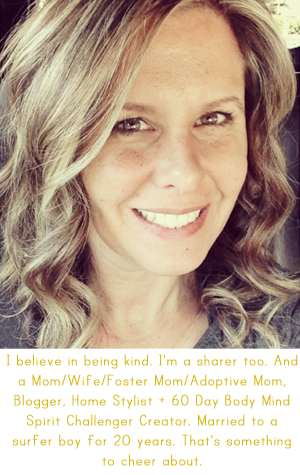 April Kennedy...My Life + My Style: What I Wore - DownEast Basics Giveaway! What I Wore - DownEast Basics Giveaway! I'm teaming up with DownEast Basics today and am so excited. Their new spring arrivals are so pretty. and boy was it hard to choose! I finally decided on the Mini Bouquet Cardi in a pretty mint green color. I'm always a sucker for a cute cardigan. And, while my usual color choice is grey, I thought I'd step out of my comfort zone and go with a pretty pastel. The embroidered flowers have the pop of color that I so love. That little bit of teal in there sealed the deal for me. 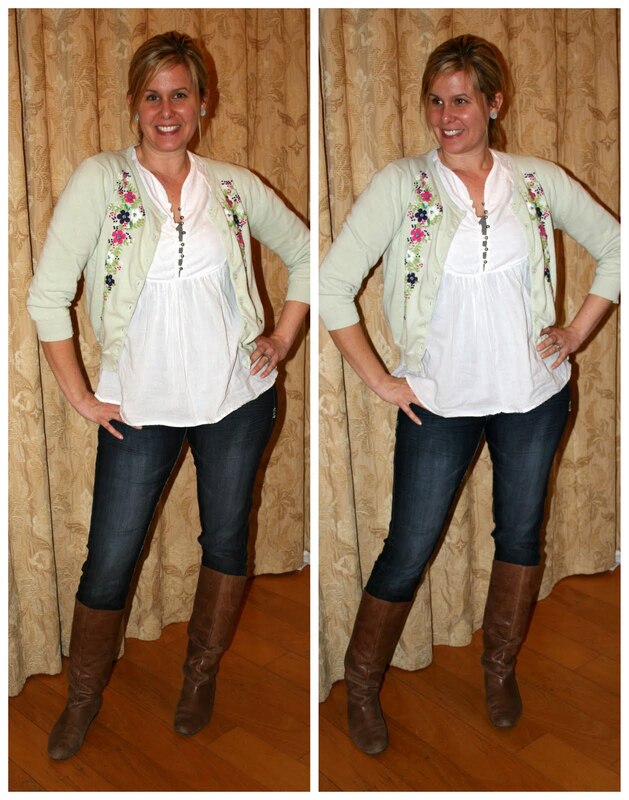 For this week's What I Wore...here is the cardigan two different ways! Lucky for me, it has been sunny this past week, really getting me in the mood for Spring. I thought I'd try out what I might wear on Easter! Even the back of the cardigan has sweet embroidery details too. is their generous giveaway I get to offer to you, my dear readers! You know how I got to pick ANY item from their new arrivals? Well, they are offering one of my readers the same opportunity! Seriously, one of you will get to pick ONE item from their new arrivals section for free. Visit DownEast Basics here and tell me in my comment section which one item would get you most 'in the mood' for Spring fashion! Get extra entries for following DownEast Basics' blog and 'like' them on Facebook. Please also include your email address. Help spread 'getting in the mood for Spring' by tweeting this giveaway! Winner will be picked by Random.org and announced on Monday 2/28. Good Luck! Thanks, DownEast Basics. P.S. I'm linking up with the stylish Lindsey and am also a guest blogger on Allora Handmade today....chatting about my fashion/shopping tips! P.S.S. A note on sizing! I usually wear an XL for DownEast Basics tops and dresses but I like my cardi's to fit a little snug. I got this one in a Large. It fits good, but is a little roomy. Possibly could have even gone with a Medium. I came over from WIWW, well sort of...clicked peoples side bars and found you!! I've just recently heard of down east but I love love love the spring scarf cardigan!! thanks for the chance to win!!! The spring cardi looks adorable on you!!! I love the cardi you have on! Also like the Spring Ruffle Cardi! Super cute! Thanks for the fabulous giveaway! Thanks for introducing me to Down East Basics. I've never heard of them before! Their stuff is adorable! I love the Best Blossoms Top! Totally gets me in the spring mood! Thanks for the opportunity! ooh I love the best blossoms top! Love there fresh & clean style. Perfect for spring. LOVE the Floral Fantasy Tank! ohmyword. Idk if I can pick just one everything is soo cute! the chich shirt dress = LOVE! I am in for this one! I think I would choose the frosted flowers cardigan or the ribbon cardigan. Maybe this year I WILL be able to FIT into their clothes!! FYI: the link to their blog isnt working. For me anyway. Anyone else having that problem? So cute!! I'd like the Spring Scarf Cardigan but it's hard to decide!! I like it all. I've never heard of them before. I love Down East Basics! I particularly love their knit dresses. I'd love to get that resort dress! I love the cardi you have on! Your sweater is great it looks just like spring! The heirloom cardi in pumice would be a cute sweater too. Thanks for the giveaway. I enjoyed your guest post too, so smart. i will take any and all of their clothing. never been to the site before...cuteness! I love the frosted flowers cardi!! I also like DownEast on FB! I LOVE the sun forever dress! :) Spring is the best time to buy clothes because of all the pretty colors. I love the Quaint Cardi, but I'd probably choose the one you have, the Mini Bouquet Cardi. It's SO cute! I love the wrap dress, it sorta says "Bring on Spring"
found you on the allorah blog! love your style and those tips were awesome! definitely digging the "miss mainden top" for spring - if only it would get here, already!! I liked DownEast Basics on FB! I love the Reflections Top in White, and am already a fan on FB! I love the sun forever dress. Also the cinch it skirt. I like the Reflections Top! I like DE on FB! Any of those fun skirts! I love wearing skirts when it is warm, so I can't wait for it to be warm again. 10 degrees just isn't good skirt weather. Love that cardi - just unsure of the size I need...so I messaged DE on FB. And I follow DE on FB as well! I want the maui maxi dress! I love the classic wrap dress. I want one of their Petite Cardigans!!! You can never have too many cardigans! I would choose the same cardi that you have. it is adorable!! I am a fan of DE on FB. I love their Resort dress! and I already like them on facebook! Loving the flower path top! I like DEB on FB. I LOVE the "full bloom" top!! I love the Spring Scarf Cardigan! I think my favorite is the cardigan you chose or the ruffle t-shirt! I like DownEast Basics on Facebook as Erin A. L.
the 'full bloom' top screams spring! I follow the DownEast Basics blog. I love, love, love the Frosted Flowers Cardi. It's so cute! I follow Down East on FB! I love the pearl girl top! So darling! Oh my gosh the sweetheart top screams my name. In both colors! Gorgeous. I love DownEast Basics. I have three skirts from them that I ADORE!!! I love the splendor skirt! I like Down East on facebook! I also like DownEast Basics on FB. I would love the Frosted Flowers cardigan in blue, very cute!! Love the mini bouquet cardi! Oh goodness, you look darling! I would love to have the passport dress! Love the Chic Shirt dress! CUTE!!! I love the sculpture shirt. So cute! I follow DownEast on facebook. I love this store! I would love the Bias Stripe Cardi! I totally covet the Draped and Dazzle top in rose wine. I think I'll have to covet it in medium. Coveting is bad, right? I may have to work on that. I am desperately in love with the Frosted Flowers Cardigan. From what I can tell it is the same (if not REALLY close) color as my spring roses that are budding right now... I LOVE LOVE D.E.B... This is my first time on your blog and I have cant stop reading. Thanks for all the fun ideas. I like Down East Basics on Facebook, so I can covet other stuff, too. LOVING the Roses Edge Skirt! Too cute. So fun! I can't wait for spring to be here, aka Skirt Season! I'm loving the Dazed and Dazzle top but I won't enter since I'm the lucky recipient of your Pretty Little Lovelies club! I just got my ring last week and LOVE it. Your pieces are beautiful. Thanks for sharing them with me! I like the Pearl Girl top - it was hard to choose tho! i think i would either go with the same cardi you got or the roses edge skirt! The passport dress and ribbon cardigan are lovely! I follow the downeast blog. Oh I can't wait for Spring! I LOVE the Going Glam Dress! So many cute things! It is hard to pick just one! I like the quaint cardigan and the resort dress. I love the cinch it skirt! It is so adorable and easy to wear! Even though that cardigan you are wearing is adorable too! I even tweeted about it! I really like the spring scarf cardigan.. very nice. That would probably work for me. I think I would like a bunch of the half-sleeve tees to wear with jeans and cute flats this spring. thanks for the fun giveaway! I love the bias stripe cardi. its so cute and casual. Also the frosted flower cardi, I couldnt decide. I like them on facebook. Oh yes, I do. Seriously girl.... TONS of comments! Wow! Ok... I would like the Spring Scarf Cardigan n Taupe because I am a sucker for a cardi too! ANd since I live on the coast I wear them almost daily! I love the Chic Shirt Dress. I looks so frilly and fun. I also like down east on facebook. Thanks for the giveaway. I LOVE the Best Blossoms Top in white. You could wear it with jeans for a casual look or with a skirt and dress it up a little! I "like" Down East on Facebook! I am digging the shirt dress! Wish it was available - I'd order it in a heartbeat! I really like the Maui Maxi Dress & the Bias Stripe Cardi... so cute! I love the Bias Stripe Cardigan. It is so cute! I "Like" DownEast Basics on Facebook as well! I tweeter about this giveaway! I like DownEast on Facebook! LOVE both outfits! The cardi looks so cute on you!! The Chic Shirt Dress doesn't necessarily say "spring" to me, but I LOVE it!! I love the Chic Shirt Dress! I love the Petite Ruffle Cardigan! I love the ribbon cardigan! Petite Ruffle Cardigan for sure! Super cute! I am in love with the Mini Bouquet Cardigan also! I "like" DownEast on Facebook and I also follow their blog! I like the ribbon cardigan. Love you, April, my dear! I would love to get the nine to five dress. I am following downeast blog! I would pick the Maui maxi dress. I think that would be a nice transition piece after the little dude arrives. Wow--these items are so cute! I'm prego right now, so I'll have to stick to a cardi like the frosted flowers one for now! SO CUTE!! I think I'm with you on that cardi! It'd be great for Easter. I am subscribed to the DEB blog. AND I like 'em on FB! Love the Mini Bouquet Cardi!! I follow DownEast Basics' blog! I like DEB on facebook! I love the frosted flowers cardigan in desert sand, that color is so "spring" to me. just one item! that's a tough one. the bias striped cardigan or sun forever dress are both calling my name! i "liked" down east on facebook.